인도의 갠지스강은 물, 수송 및 음식의 원천으로서 집안에 사는 수백만 명의 사람들에게 생명줄이다. 쿰브 멜라(Kumbh Mela)로 알려진 힌두교 순례 여행 동안, 갠지스강은 49일 동안 강에 목욕하기 위해 1억2천만의 사람들이 인도 전역에서 도착함에 따라 지구상에서 가장 큰 인류 모임을 개최한다. 엄청난 정신적 중요성에도 불구하고, 갠지스강은 세계에서 가장 오염된 물을 가지고 있는 것으로 유명하다. 갠지스강 유역 인구의 79%가 가장 가까운 하천은 농작물 관개에 대한 하수오염 기준에 위배된다. 인구의 약 85%가 목욕하기에 안전하지 않은 물 근처에 살고 있으며 알라 하바드(Allahabad)는 그 곳 중 하나이다. 우리 자신의 연구에 따르면 인근 도시에 사는 사람들의 수가 증가함에 따라 갠지스강의 수질 문제가 악화되었다. 갠지스강 유역의 도시 인구는 농촌지역보다 1인당 약 100배 더 많이 강의 미생물 오염에 기여하고 있다. 이는 하수구가 없는 하수도가 하천 수질을 악화시킨다는 것을 의미한다. 10년간의 수질 데이터를 조사한 결과, 대변의 대장균 농도(인간 배설물에서 발견되는 공통 오염지표)는 상류에 거주하는 사람들의 밀도가 증가했을 때 증가하는 것으로 나타났다. 이것은 의미가 있다 : 더 많은 사람들이 더 많은 배설물을 배출하고 있다는 것을 의미한다. 그러나 우리는 또한 인도의 도시에 살고있는 사람들이 농촌인구보다 더 많은 공해를 낳는 것을 발견했다. 인도의 한 지역에 살고있는 사람이 1,000명/㎢인데, 이는 런던 중심부와 비슷한 밀도로 가장 가까운 강에 100배(1,00명/㎢)나 더 많은 오염을 일으킨다. 그렇다면 왜 인도 도시에 사는 사람이 시골에 사는 사람보다 더 많은 하수오염을 일으키는 것일까? 물론 도시의 사람들은 실제로 농촌 지역의 사람들보다 훨씬 더 많은 배설물에 기여할 것 같지 않다. 대신, 아마 하수도가 되어 비난받을 것이다. 도시에서는 광범위한 하수도 네트워크가 하수도를 강으로 효율적으로 유출하는 반면, 농촌지역에서는 더 많은 사람들이 개방형 또는 구덩이용 화장실에서 배설한다. 이것은 농촌지역의 배설물이 강으로 씻겨질 가능성이 적고 그들이 운반하는 박테리아와 바이러스가 현장에서 죽을 가능성이 높다는 것을 의미한다. 갠지스강 유역의 물은 자한 기아 섬에서의 삶에 필수적이지만 오염은 건강상 위험하다. The Ganges is a lifeline for millions of people who live within its catchment as a source of water, transport and food. During the Hindu pilgrimage known as Kumbh Mela the Ganges plays host to the largest human gathering on Earth as 120m people arrive to bathe in the river over 49 days. Despite its tremendous spiritual significance, the Ganges is also notorious for having some of the most polluted water in the world. For 79% of the population of the Ganges catchment, their nearest river fails sewage pollution standards for crop irrigation. Some 85% of the population live near water that isn’t safe for bathing and Allahabad - where Kumbh Mela takes place in 2019 - is one of those places. Our own research suggests that as the number of people living in nearby cities increases, the problem with water quality in the Ganges worsens. Urban populations in the Ganges catchment contribute around 100 times more microbial pollution per head to the river than their rural counterparts. This means that untreated sewage discharged from a sewer appears worse for river water quality than sewage discharge where there are no sewers at all. When we examined 10 years of water quality data we found that the concentration of faecal coliforms - a common pollution indicator found in human faeces - increased when the density of people living upstream increased. This makes sense: more people means more poo. But we also found that people living in cities in India contribute more pollution per person than those in rural areas - how much more depends on the population density. A person living in an area in India with 1,000 people per km², a density similar to central London, contributes on average 100 times more pollution to the nearest river than they would in an area with 100 people per km² - say, rural Devon in the UK. So why does it appear that a person living in an Indian city produces more sewage pollution than someone living in the countryside? Of course, people in the cities are unlikely to actually contribute significantly more faeces than those in rural communities. Instead, it’s probably sewers that are to blame. In cities, extensive sewage networks efficiently flush sewage to the river, whereas in rural areas more people defecate in the open or in pit latrines. This means faeces in rural areas are less likely to be washed into the river and the bacteria and viruses they carry are more likely to die in situ. As the population density of a place increases, sewers become more common. 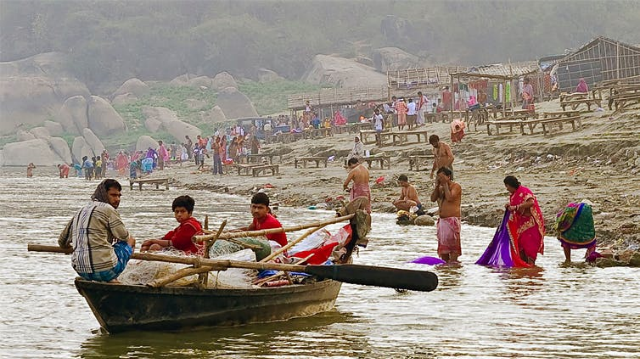 Sewage removal is essential for the protection of public health, but without effective treatment, as is typically the case in the Ganges catchment, it comes at the cost of increased river pollution and waterborne diseases for people living downstream. It’s therefore clear that water quality in the Ganges is a more complex and widespread problem than previously thought. We’d expected that cities, with their more advanced sewage management, would be better for the river. What we found was the opposite - more sewers without sewage treatment makes river pollution worse. The urgency to invest, not only in sewers, but in the treatment of sewage has never been greater - especially in the most densely populated areas. However, the Western approach of taking all waste to a central treatment plant is expensive and so may not be the best solution. Onsite treatment technologies such as off-grid toilets or decentralised treatment plants are rapidly developing and may help improve river water quality sooner, enabling more and more people to celebrate Kumbh Mela safely.